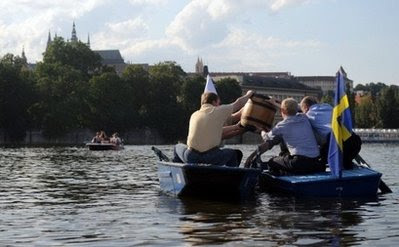 The handover of the Presidency of the European Union from the Czech Republic to Sweden was marked by the symbolic passing of a barrel of beer from a boat rowed by the Czech minister for EU affairs, Stefan Fule, to a boat with a delegation from the Swedish embassy, in the middle of the Vltava River in Prague last Saturday, AFP reports. This could be the start of something big. Why didn't we celebrate the appointment of a new Speaker of the House of Commons by getting Michael Martin to pass a six-pack of Special Brew to John Bercow on ceremonial shallops in the middle of the Thames? It would make a lot more sense than dragging Mr Speaker to the chair. And Andrew Motion could have handed the new Poet Laureate her barrel of sack from a Thames Waterman Cutter opposite Shakespeare's Globe.